>Members of SARO joined PETA to protest the cruel use of animals at Ft. Drum. Thousands of live animals are shot, stabbed, dismembered, burned, and poisoned every year in Department of Defense (DoD) training exercises, designed to train medics and infantry in how to treat various human battlefield injuries. 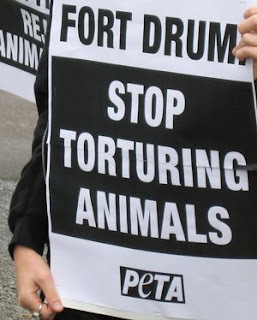 Fort Drum plans to fatally wound live animals for the sole purpose of treating their traumatic injuries. Mutilating living animals to teach military medics how to treat injuries in humans is both unethical and ineffective. The physiology and anatomy of non-human animals are drastically different from that of humans, and more sophisticated non-animal simulators are used in most medical schools and at several military trauma centers. We need your help in urging Fort Drum to end its outdated trauma-training exercises on animals and adopt one of the many non-animal methods – such as rotations in military trauma hospitals and the use of the DoD’s own Combat Trauma Patient Simulator. 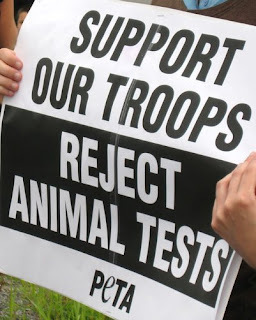 Please be sure to send PETA’s automated letter to your congressional representative and senators asking them to urge President Obama to ban military trauma exercises on animals. This entry was posted in animal cruelty, animal testing, cny, government, military, peta on July 25, 2009 by saro.